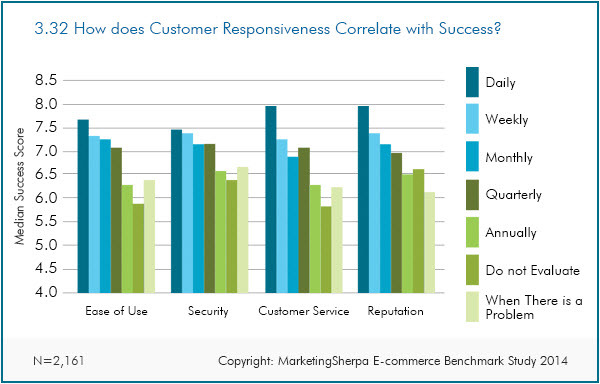 Ecommerce Research Chart: Does customer responsiveness correlate with success? SUMMARY: Amazon wants to make its fulfillment process so quick and efficient that it is testing drones to deliver products. Target's longtime CEO recently resigned and its Q4 profits were down 46%, which some see as part of the fallout from the retailer's massive data breach. Focusing on the customer should correlate with success, while alienating the customer should have the opposite effect. But does it? In this MarketingSherpa Chart of the Week, we'll arm you with the data you need to make investment decisions (or gain budget approval) to serve your customers better than the competition. We then correlated this data against the respondent's median weighted success score. The weighted success score was created by Diana Sindicich, Senior Manager, Data Sciences, MECLABS (parent company of MarketingSherpa). It includes factors like financial metrics (e.g., year-over-year difference in annual and ecommerce revenue), and you can read more about it on page nine of the Benchmark Study. Decades ago, Peter Drucker famously said, "The customer is the foundation of a business and keeps it in existence. He alone gives employment." Drucker's prescient remarks hold true today. As you can see in the chart, across every surveyed aspect, the more often companies conducted evaluations to see how well their customers were being served, the more likely they were to be successful. Of course, this data shouldn't be shocking to you. If you ask any marketer, everyone would say that their company should take good care of customers. But do you? To quote Stephen Covey, "Do you and I know some things we should do [that] we don't? I shouldn't eat that cookie, but I do. What is common sense is not common practice." "Although not necessarily a marketing challenge, site security was also a concern this year. The resolution to this was increased auditing of site security and ensuring developers were better informed on current practices," stated a Benchmark Study survey respondent. While many ecommerce companies might not consider security a marketing expense, data breaches can damage the brand and customer anxiety can damage sales. For these reasons, one respondent urged other marketers to "make sure that you have security built into your marketing plan." "Plants have, for many obvious reasons, been an historically difficult thing to ship, and this presents us with likely our greatest challenge: making sure our product arrives to the customer in the same great shape our reputation is locally known for." Once you do right by your customer, you have to communicate that out so your company builds its reputation beyond that one happy customer. You can use testimonials in advertising and on your website. Social media can help, as well. One marketer responded, "Online reputation was average, but we worked on social media for that a lot." Online review sites are also becoming increasingly important — serving customers well enough that they want to give you a positive review. One marketer responded, "How do you manage a reputation, where there are a lot of people going online to say negative things, but the bulk love the product? The noisy [negative] ones are the loudest." This is where customer service comes in. Everyone won't love your product, no matter how good it is. Or even like it. The goal of customer service in a marketing context is to diffuse negative feelings with your company with such great service that unhappy customers will want to shop with you again. Or, at the very least, won't slam your company in online review sites or social media. After all, who would speak ill of someone who truly helped them? Not an easy task, especially for a growing company, as one marketer responded her greatest challenge was "growing our sales by 200% while improving customer service and fulfillment processes." Customer responsiveness and creating a customer-centric ecommerce store is no easy task. But if you don't serve the customer, your competitors will. So use the above chart to help make the investment decisions you need to put the focus back where it belongs — on the people who write the checks (well, type in their credit card information, but you get the idea).